Why can’t Google be more consistent with its data? Part of the reason for the success of online marketing is the ability to plan our work in accordance with solid data. It’s no wonder, then, that when Google provides us with two versions of what ought to be identical data, and they don’t match up, it makes our job quite a lot harder. One recent incident showed very clearly how wildly Google’s data can vary, according to where it comes from. 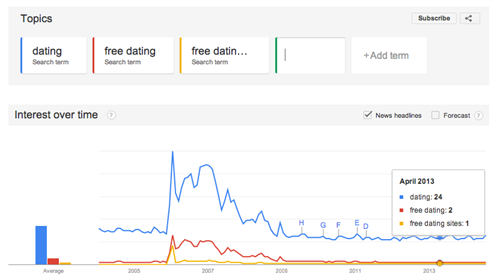 Google Trends data here shows dating significantly above free dating, which is just above free dating sites. Keyword planner data, meanwhile, shows a very different spread. Both data sets were taken on the Worldwide setting. 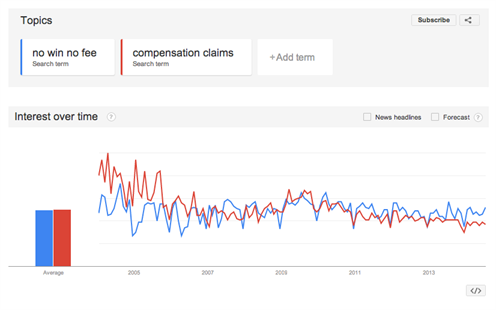 In another example, based on data for the personal injury market, Google Trends data shows ‘no win no fee’ and ‘compensation claims’ very closely matched. Keyword Planner data, meanwhile, shows an over 7.5 fold discrepancy. Again, both data sets were taken on the Worldwide setting. This example, variations of which are seen daily by agencies and businesses all over the country, shows how tricky it is to gauge accurately how we should be bidding on any given keyword. The only reliable method appears to be bidding low and tweaking that bid upwards regularly until we seem to be positioned in about the right spot. This system, while it does allow us to make logical steps to end up with the correct bid in Adwords, does seem to make the entire process unnecessarily complex and long-winded. It made us wonder about some of the details to do with how Google provides us with this data. Why is Google not able to be more consistent about data which it owns? Google Trends is a tool that provides insight into Interest over time. Trends does not convey absolute search volumes. This is because Trends data is heavily normalized. Detailed information can be found here. Google trends data is based on a sample of the absolute search volumes. So, searches with low volumes and multiple searches by the same user over a short period of time are excluded. Detailed information can be found here. What about the discrepancies we see across other products? So far, we’ve only looked at the discrepancies when comparing Google Trends with Google’s Keyword Planner. However, we’ve also seen plenty of examples of data inconsistencies when using other products, such as Google Analytics and Google Adwords. Google suggests a number of explanations as to why data provided by one source may differ from supposedly identical data from another, even when the data and the products both belong to Google. For example, we are given four main reasons why data may differ between Adwords and Analytics, along with a number of reasons for discrepancies between clicks and visits, and an explanation as to why there may be discrepancies in the conversion rate across the two products. How should we deal with these discrepancies? In online marketing, data is everything. We use it to plan campaigns; we spend time analysing it and we draw inferences from it to improve our practices. Our ability to do use data with pinpoint precision marks us out from almost any other marketing channel. We know, therefore, that drawing on incorrect data can have very negative implications for businesses who choose to market themselves online. So how can we avoid making mistakes when we can’t entirely trust the data we’re provided with? It comes down to hard work: test, analyse, and rework your plans and bids as you go along. Don’t take anything for granted or you could be in for a nasty shock!